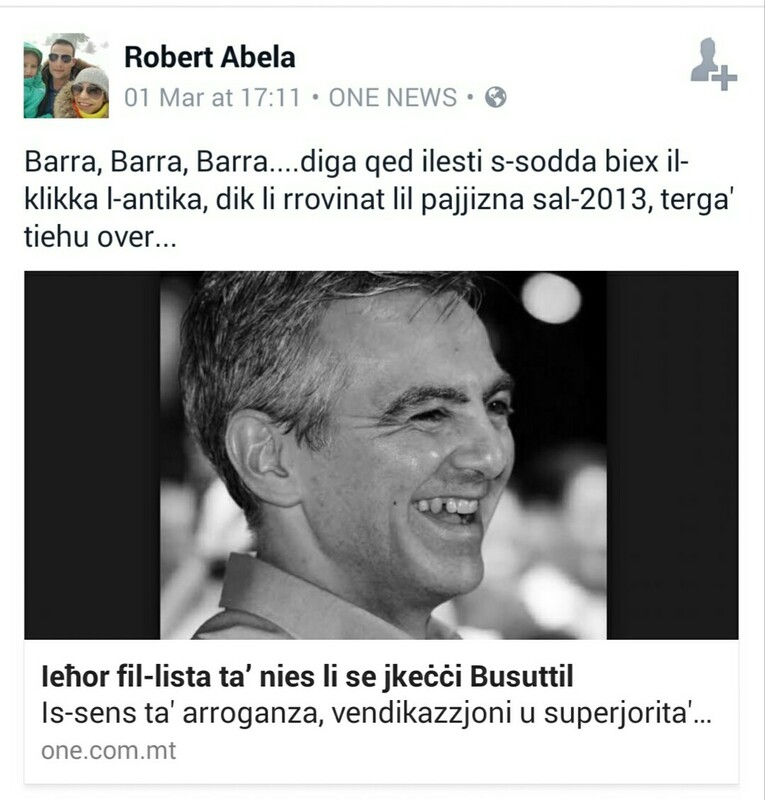 Here is Robert Abela, talking about “the old clique that ruined the country before 2013” and how they can’t wait to get into power again. The man is utterly, but utterly, shameless and disgraceful. “The old clique that ruined the country before 2013” made his father head of state, allowing Abela junior, his pushy wife and her money-grabbing sisters to run riot all over the Community Chest Fund, San Anton Palace and Verdala Palace for five years, with Robert and Lydia Abela even having a marble plaque affixed to Verdala Palace to mark the baptism of their baby. And before that, “he old clique that ruined the country before 2013” gave Robert Abela and his father the contract for legal services to the Malta Environment and Planning Authority, which he and his wife Lydia are still milking 16 years later. Between 2001, when they first got the contract, and 2011, they billed the Planning Authority for €1.23 million in fees. They are estimated to have billed a further €500,000 in fees in the six years since. They’re not at risk of having the Opposition ask a question about that in parliament, because this was one of the Nationalist government’s stupider and more corrupt/crony moves: its way of ‘thanking’ George Abela for his support in the drive, against the Labour Party, to EU membership. Which brings me to how “the old clique that ruined the country before 2013” took Malta into the European Union, with the full support and involvement of Robert Abela’s own father, working behind the scenes, while the Prime Minister to whom Robert Abela is so busy sucking up now was fighting tooth and nail to keep Malta out of the EU. Do Robert Abela and his clique know that his father worked behind the scenes on the campaign for EU membership and that he worked particularly closely with Prime Minister Gonzi in this regard? He must do – which only makes his behaviour all the more disgusting. He leeched off his father’s closeness to Prime Minister Gonzi, milking that situation to his advantage, and now he and his wife are leeching off Prime Minister Joseph Muscat for all they’re worth. Robert and Lydia Abela’s sense of entitlement, their arrogance – and above all, their sheer ungracious bad manners, greed and avarice – are horrendous. He may not look like a bogan – she most certainly does – but that is exactly what they are, given their behaviour.